This article comes from a talk given at The University of New Brunswick on March 16, 2017 by Professor Duchesne. The attendance was about fifty, mainly students, about eight academics, and some residents from NB. The talk lasted about 25 minutes followed by Q&A for about 70 minutes. 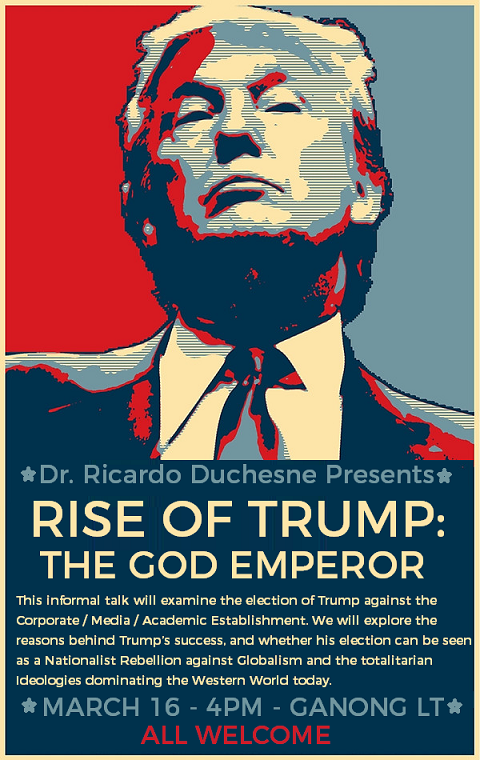 At the end, many came out thinking that Trump may be an Emperor, after all. Globalism is the dominant ideology of our times and it unites the Left and the Right. Globalism should not be confused with globalization. Globalists purposely encourage this confusion, but globalization is factual account about the accelerating interactions of nations since the discovery of the New World and the creation of international markets, shipping and railway communications networks, in the sixteenth century through the nineteenth century. Globalism, on the other hand, is an ideology about how our current elites, on the Right and the Left, would like things to be politically. Globalism is an ideology that advocates open borders, mass immigration, and the liquidation of (Western) national identities. It advocates, under the guise of diversity, the obliteration of "indigenous" European cultures, and the creation of a generic culture dedicated to consumerism and universal human rights. Globalization is not an ideology but a factual state of affairs about the growth of communications and trade in the modern era. Both the leftist and the corporate right establishment are globalists, and both portray globalism as if it were an inevitable fact intimately associated with the growth of trade and communications. But globalism, as Robert Locke points out, is a deliberate political choice, no more inevitable than the establishment of feminism, transsexualism or communism. Mass immigration is not inevitable, it could be stopped tomorrow. The European Union, which seeks to diminish the political independence of European nations, could be abolished, and this would not bring an end to globalization, any more than Japan's decision not to diversify itself through mass immigration has limited its ability to become a global economic power. Nationalism and globalization can co-exist with each other, and did coexist in the past. But nationalism and globalism cannot coexist with each other. The Left-Right establishment wants globalism. Trump is a critic of globalism. He wants to put America and Americans first, though he is a civic nationalist, which is a softer nationalism than I would like. He has not yet express criticism of legal immigration. Students today are being made to believe that globalism is the same as globalization, an inevitable process of the current age of intensive communications, travelling, and global investments. They are taught that "massive numbers of people are moving across borders, making virtually every country more polyethnic in composition." Or that "all societies are becoming increasingly multicultural, while at the same time becoming more porous." These are the words of Will Kymlicka and Charles Taylor, the foremost theorists of Canadian multiculturalism. They are deliberately deceiving Canadians into believing that the swamping of Canada with immigrants is an inevitable product of globalization. The truth is that "only a tiny proportion of the world's population is mobile across international borders." Today about 96 percent of the world's inhabitants are living in the country in which they were born. More than 98 percent of the people in less developed countries were born in the country where they reside. Immigrants have accounted for a mere 1.4-1.6% of Asia's population over the past twenty years — despite fertility rates well below replacement levels in Japan, Singapore, South Korea, Taiwan, and other Asian countries. These Asian nations are thoroughly globalized, but they don't accept globalism. Globalists hate European national cultural identities. In the last decades leftist globalists have carried relentless campaigns to decouple Europeans from their nations and their cultural traditions. 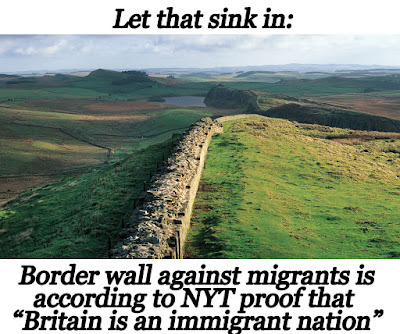 These attacks have taken many forms, revision of their histories, fake claims that they are all immigrants, coupled with the promotion of guilt about the "genocidal actions" of the founding peoples, reinterpretation of European national identities in purely civic terms, and the equation of any form of cultural nationalism with Nazism. Corporate globalists prefer to produce goods with a generic identity for consumers across the globe. They prefer niche markets without clear national boundaries, with different parts produced in different regions, incorporating hybrid styles, in music, adornments, furniture. People who are rooted culturally are less suitable consumers of these hybrid-generic commodities. They don't want consumers and producers with a sense of national identity who will care about the "national" economy, national jobs, and resent corporations who move in and out of towns without caring for the effects these movements have on the communities. People who are rooted like to protect their culture and economies, which goes against the globalist mentality of Western corporations. They want cultures to be interchangeable parts of global markets identified only by their adherence to cosmopolitan/postmodernist values. They want a homogeneous commercial pop culture to replace authentic traditions. Corporations love the way leftist causes adorned this consumerist culture with humanitarian concerns about transsexual rights, "discriminated minorities" and "suffering refugees." Despite their varying emphasis on different aspects of globalism, the Left and Right have really converged in a state of amicable reinforcement. The Right's main interest has been the promotion of policies that augment the expansion of global capitalism, deregulation, freer mobility of capital and information at low cost between borders, as well as international labour migration. The Left's globalist narrative is more complicated and goes something like this: Humans are members of the same species; the racial differences between them are superficial, cultures should not be viewed in "essentialist" terms, but as constructs in a state of change. Liberation consists in allowing individuals to express themselves without being tied to pre-given identities, be they cultural, national, or sexual identities. With the "freeing" of humans from identities "constructed" by "White males" and the emergence of "complexly" new gender and racial identities, humans will learn to become global citizens, identifying themselves as members of an "international community" devoid of hierarchies of dominance. These new humans will be morally sensitive to the suffering of "strangers," quick in their responses to violations in the human rights of everyone, assist those threatened by famines in Africa, tsunamis in Asia, floods and earthquakes, while celebrating trans-sexuality and pan-sexuality in an orgiastic state of happiness. The Left and the Right have actually reached a new consensus on the supposed economic benefits of mass immigration. The dominant pro-immigration argument today is really a combination of Right and Left economic concerns about how the populations of Western countries are set to decline dramatically in the next decades due to continuing below-replacement fertility rates, which is resulting in a shrinking labour force, at the same time as there is a growing aging baby boom generation, which will bring a decline, or so they argue, in both economic growth and in the possibility of financing socialist programs. A decline in population, both sides say, will bring a "massive" crisis which, left to its own, without mass immigration, will result in widespread labour shortages, lower tax receipts, declining welfare supports and lower consumption levels.Only now has this convergence come to be well understood with Brexit, the election of Donald Trump, and the persistent growth of populist nationalist parties in Europe with platforms that stray between (and away from) traditionally left and right positions. As a recent mainstream article announced: "Forget left and right — the new divide in politics is between nationalists and globalists." Before these developments, the academic world had no clue about this convergence. The Fake Media portrays nationalist parties as "far right extremist parties." It portrays the supporters of Trump, Brexit and these parties as racist, as xenophobic people who can't handle change, can't cope with the sophisticated cosmopolitanism of the media and academics. They portray the working classes as parochial, small town characters who are against openness and change. Or, now that Trump won, and they want to get the working class vote, they portray them as victims who need to be attended with more welfare expenditures and government-initiated job creation programs, while still advocating mass immigration. When we examine the class background and the moral concerns of these two sides, the globalists and the nationalists, we find that the former are generally well off whites living in cities, university towns, benefiting from cheap migrant labor, ethnic restaurants, and international students. This elite has little attachment to any locality, to any people, they are not loyal to any culture other than to consumerism and status-enhancing, easy to follow, "humanitarian" causes. They claim to be more open and tolerant but they are intolerant of anyone who questions their ideas and of any expression of European identity. Nationalists, on the other hand, are people who have different, and wider moral concerns, they feel a bond with their country, their heritage, and they fell that citizens should be loyal to their country. They are Westerners who value freedom of expression, individuality, but they also value in-group loyalty, traditions, and open debate. Their moral concerns are more sophisticated and inclusive than the moral concerns of globalists. Between 1900 and 1950, the foreign-born fraction of the population rose, but never exceeded 5%. By the early 1990s, it was well above 5%. In 2011, it was around 13%. And today, it is probably above 15%. 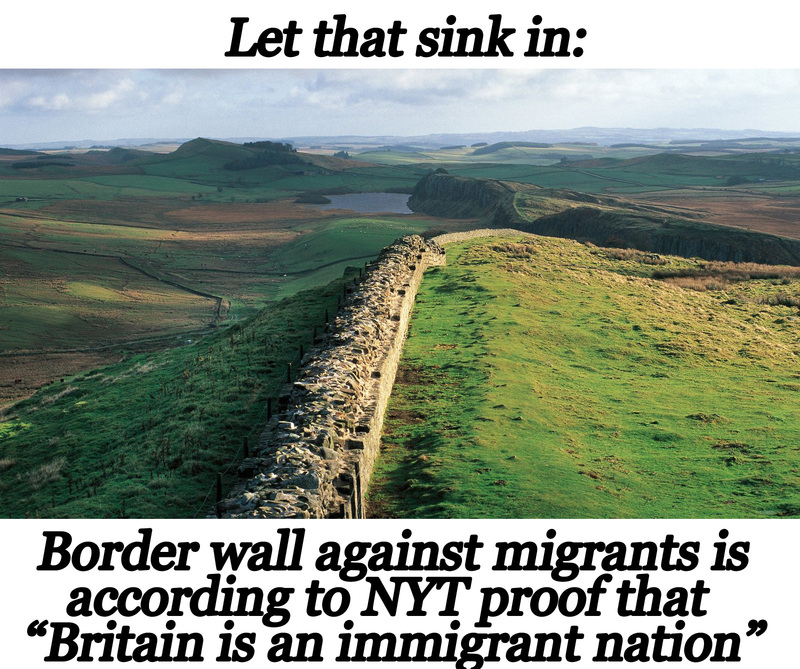 Thus, contemporary levels of immigration into Britain are historically unprecedented. Estimates for the fraction of the population that Normans comprised, following the Norman conquest in 1066, range from 1% to around 5%. Between 1066 and the turn of the 20th century, it is unlikely that the foreign-born fraction of the population ever exceeded 2%. 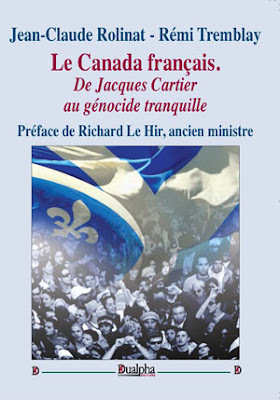 French Huguenots, for example, are unlikely to have constituted more than 1% of the population. The Romans, Vikings and Normans may have ruled or invaded the British for hundreds of years, but they left barely a trace on our DNA, the first detailed study of the genetics of British people has revealed. The analysis shows that the Anglo-Saxons were the only conquering force, around 400-500 AD, to substantially alter the country's genetic makeup, with most white British people now owing almost 30% of their DNA to the ancestors of modern-day Germans. Those of us who care for truthfulness, the indigenous peoples of Europe, and the people who built the United States, Australia, New Zealand, and Canada welcome the election of Trump the God Emperor.